Last month was good for small Fiats and for the trio Up!/Mii/Citigo. They all increased their sales compared to September figures, but Italians did better allowing the Panda to claim the leadership again. This time, for better understanding of sales data, the trio coming from Slovakia is clearly divided so there can be a better comparison. 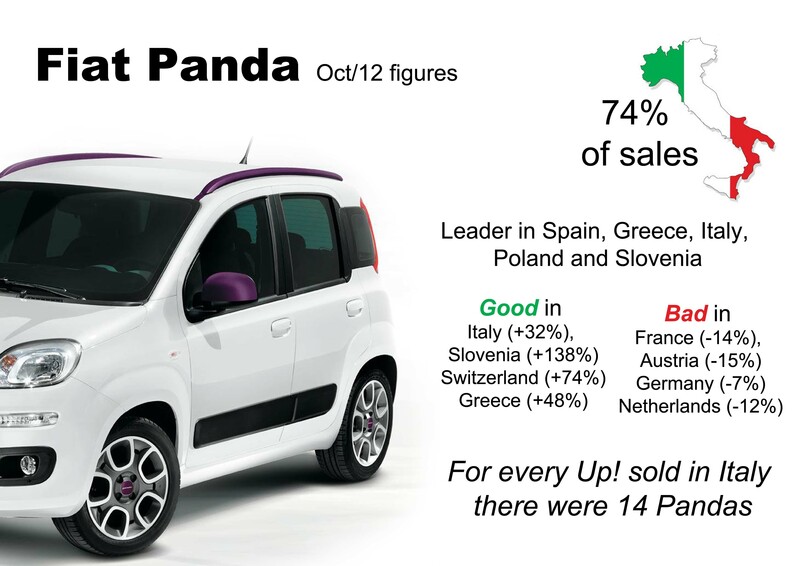 In October the Panda sold 16.566 units, which is 1.341 unist ahead of Up!/Mii/Citigo together. It means the Panda is up 21% compared to September, while VW cars are up 11%. Meanwhile the 500 is up 18% and had the best month since June. In fact the Cinquecento sold more units than VW Up! only, which is not bad, taking into account that the Up! is sold with 2 body types (3 and 5 door), is 4 years younger and its native market (Germany) has not shrunk as much as Italian car market. VW is not doing bad with its small cars but Fiat impresses not with the new Panda but with the ‘old’ 500. Yes, Panda’s popularity is bigger in Italy, and its makes it the best-seller car of Fiat Europe nowadays, but the 500 is less Italy dependent and its success in other European countries keeps going, no matter the car is 5 years old and competition has got hard not only with VW but with Opel and its Adam model. In fact yesterday Tychy plant in Poland, where the 500 is produced for the whole world, except the Americas, announced they produced unit number 1 million. So the Panda is back in the podium allowing it to come back in Europe’s top 10 best-selling cars at place number 9. A total of 16.566 Pandas were sold in 15 European countries but this time Italy counted for more. In October almost 3 out of 4 cars were sold in Italy which is a big concentration in just one market. October 2012 was the second best month so far this year (after May with 12.813 units), but in terms of share, the Panda got its best month ever. In the other hand, Panda’s registrations outside Italy are down 1.4% from 4.443 units in September to 4.381 in October. It keeps being Europe’s best-selling minicar but this generation seems to be much more dependent on Italy. Actually there is just one market above 1 thousand milestone besides Italy: Germany. Almost 1.400 units were sold there, down 7% or 100 units compared to September. Then comes France, down 14%. The car had a good performance in Switzerland, up 74% or 100 units, Slovenia (+138%, or 54 units) and Greece (+48%, or 38 units). Compared to the 500, the Panda was more popular in Czech Republic, Spain, Greece, Italy, Netherlands, Poland and Slovenia. And compared to the Up!, the Panda clearly wins in Spain, once again in Greece, of course Italy, Poland, and once again in Slovenia. 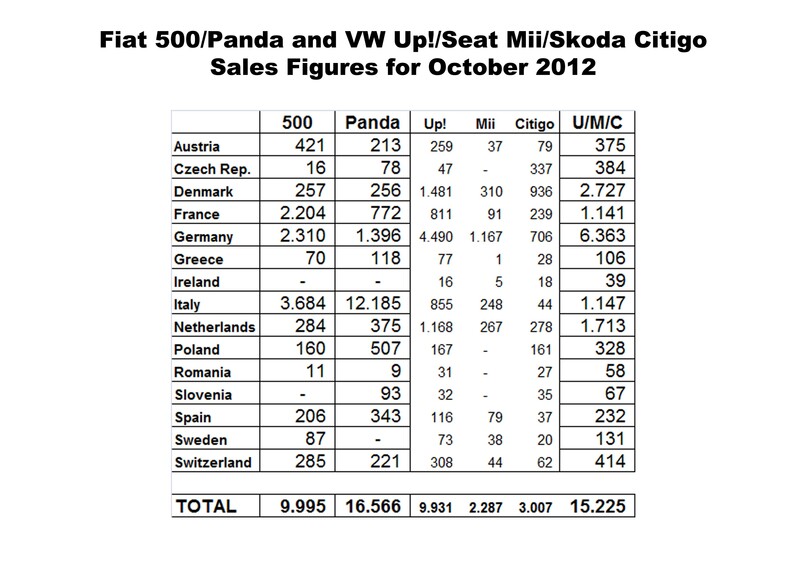 If the Citigo and Mii registrations are counted, then the Panda beats them in Spain, Greece, Italy, Poland and Slovenia. The 4×4 version should boost Panda’s sales from now when winter is about to begin. The 500 did also good. If it wasn’t because of the Seat Mii and Skoda Citigo, the 500 would occupy second place among best-selling city cars, as it sold 9.995 units against 9.931 VW Up!. This result is really good for the Cinquino. Its sales were mainly boosted by France and Germany markets, up 58% and 35%. The reason fot this spectacular growth is unknown but the car was France’s second best-selling mini car after Renault Twingo (ahead only 1.414 units) and above Peugeot 107 or Citroen C1. The 500 sold twice as much as what the trio from VW sold together. In Germany the 500 was the third best-selling city car after the Up! (ahead 2.180 units) and Smart (ahead 340 units). In both countries, the Fiat got record numbers. In Italy was not that good. Though it is up compared to September (+4% or 140 units) the car could do much more. Yes, Italian car market is along with Spain the worst in terms of fall, and the 500 is not really cheap. But Fiat should make more to boost its sales (in October Italy was again the second larger market for the 500, after USA). From the 15 markets analyzed Fiat 500’s sales increased in 12, while it had a very big fall in the Netherlands, down 59% or 409 units. Compared to Up! 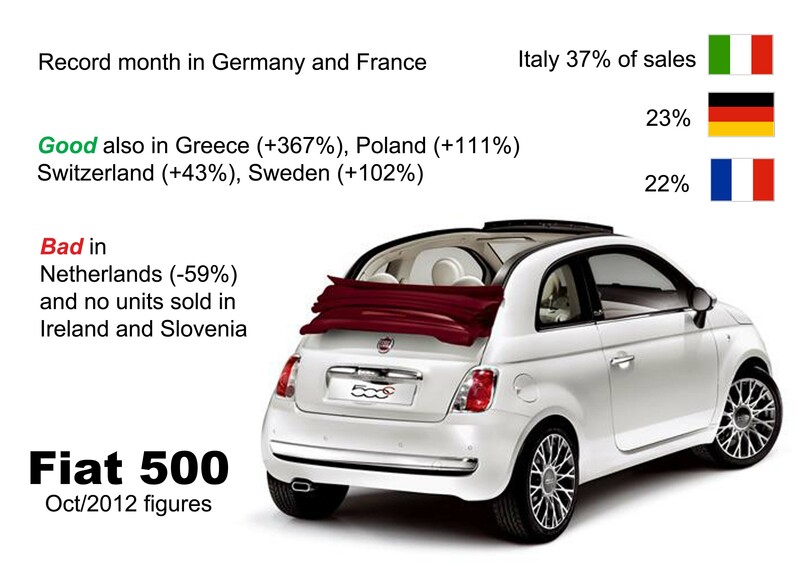 sales, the 500 beats it in Austria (where VW is really really popular), Spain, France, Italy and Sweden. It’s important to mention that the new 500L sales are not included in any of these numbers. Finally there are the VW Up!, Skoda Citigo and Seat Mii. They all sold 15.225 units together, up 11% or 1.509, that allowed them to have their best month so far. From that total the Up! counts for 65%, while the Citigo is in second place with 3.007 units (20%) and the Mii with 2.287 units. They continue to be very popular in Denmark, the Netherlands and of course Germany. Nevertheless their sales figures for larger markets such as Italy, France and Spain are not that good. Compared to September figures the trio’s sales declined in the Netherlands (-37% or 992 units), Greece (-22% or 30 units), Romania (-17% or 12 units), Austria (-6% or 22 units), and Poland (-2% or 7 units). Regarding the Skoda and Seat, it is important to mention that Skoda Citigo was the absolute leader of the segment in its native Czech Republic, over its twin the Up! and of course the 2 Fiats. Both, the Mii and Citigo were more popular in Denmark and Ireland (were not even 1 Panda or 500 were sold). In Poland (where Skoda is the top-selling brand) the Citigo was ahead of the 500 by only one unit. 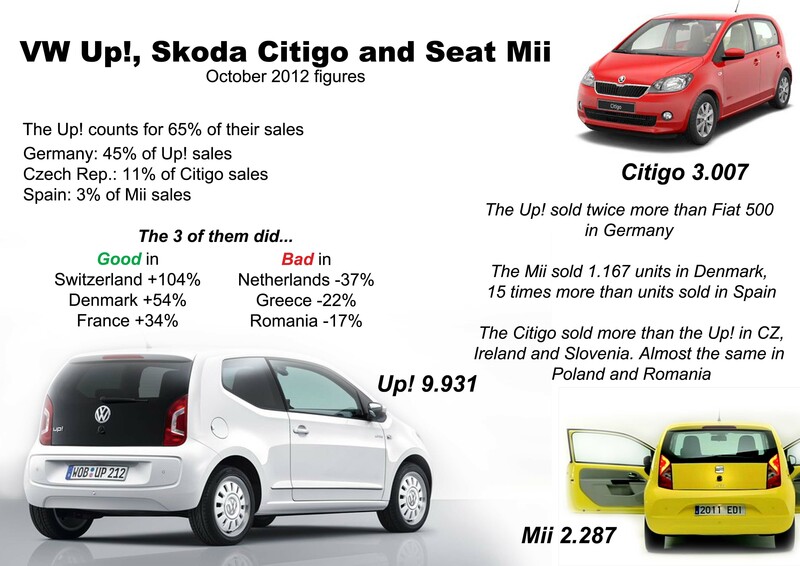 In Romania there were no Mii sales but the Citigo beated both cars from Fiat. At the end it was important to split sales figures for the 3 models of VW Group, no matter they are the same car. 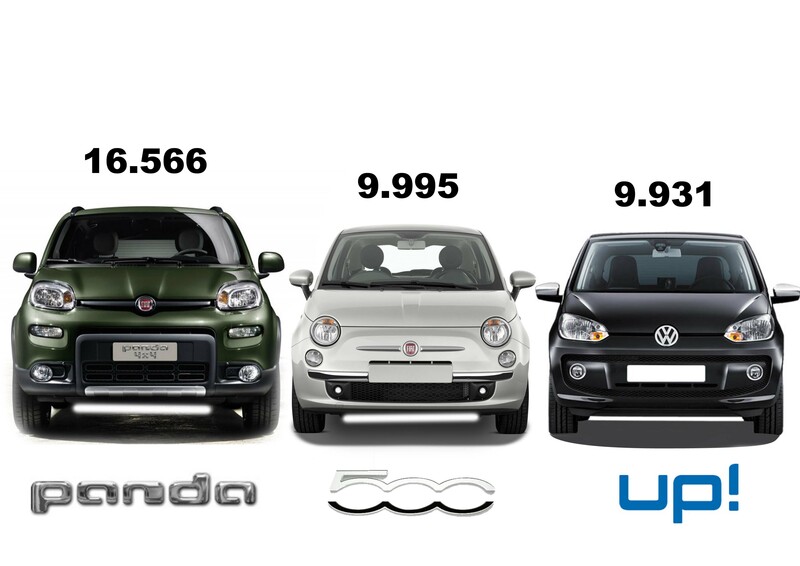 It is useful to make a deeper analysis of Fiat Panda/500 sales against the VW Up!, which becomes popular but is still behind the Italian citycars. Fiat can do more!Absolutely more with all the new panda versions and with the next 500..maybe they will introduce othe new versions..the zagato and the giardiniera..and why not,a giardiniera trekking!That’s gonna be my car! it would be a much more complete analysis having the british data too but i know they’re not that easy to get. anyway Britain is Europe’s second largest market and 500’s second largest market in Europe after Italy. You are right. The UK is a great market for the 500. Cumulative sales figures till September show that Fiat 500 sold 27.345 units, much more than 25.607 units sold in the whole year 2011. Unfortunately there is not always data available. 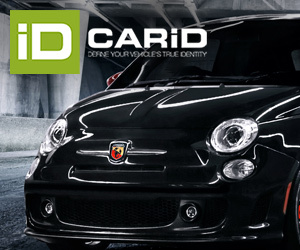 Fiat brand -19.7% in October. All of Fiat is 37041 units YTD. Is the 500 making up 75% of Fiat sales in the UK? And, yes, 500 is 29215 units YTD, That’s indeed about 67% of the total Fiat YTD sales figure of 43740. SMMT does have full data available by subscription, but I have no idea what the subscription cost it. Interesting would be to see a split up between ‘old’ and ‘new’ Panda sales figures. As well as the FWD / 4WD ratio.